Denon launches £219 AH-C820W wireless neckbud headphones | What Hi-Fi? 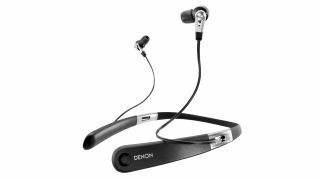 Neckbud-style headphones are, like true wireless headphones, becoming increasingly prevalent in the market, and Denon is encouraging that trend with its new AH-C820W. These neckbuds are the first headphones to combine dual drivers with the brand’s patented Denon Double Air Compression technology, which sees a 11.5mm driver positioned in front of a second driver, supposedly allowing greater movement of air tighter control of bass performance. Denon has worked to damp vibrations by mounting the drivers in a die-cast zinc and resin housings, and ports at their rear are designed to help equalise air pressure behind the drivers to reduce distortion. Low-latency aptX Bluetooth provides a wireless connection between the headphones and your source, while a USB cable offers wired listening and charging. Speaking of which, they offer a claimed rechargeable battery offers 10 hours of listening. The neckband’s vibrate function can alert owners of incoming calls on a paired phone, too, and the Denon Audio app opens doors to various functionality, including audio optimisation for the connected portable device, a player interface for playlists and play queues, and access to TuneIn Radio. Last but not least, the AH-C820Ws are fitted with Comply TZ500 memory foam ear-tips, of which there are five supplied sizes. The AH-C820Ws (£219) will be available in December.